I often get questions about the respecitve benefits of Tableau vs. QlikView - and which of the two I prefer. For me it is not a hard question to answer as I tested both programs when I started using a visualization tool. Although there is no doubt that both programs can create value, I think Tableau is superior on many levels. When working in QlikView you clearly see that the company behind it was founded in the same year as Windows NT 3.1 was released! You have to work through countless tabs placed in a very non-logical menu structure. Look at the menu below - where would you for example go to change the axis tick marks on a chart? General? Presentation? Visual Cues? Style? Or perhaps layout? Tableau on the other hand follows modern GUI principles with no clutter - and I must admit that I like not having to think too much. Lets face it - it is possible create bad visualizations with every self-service BI tool. But with QlikView it is possible to make extremely bad visualization. These include 3d charts, gauges and faded bar charts. These features are simply not available in Tableau, who have chosen to take a stand and nudge their users towards building meaningful visualizations. I like working with a tool where it is not possible to do things completely wrong. This point is connected to the one above, but deserves its own headline anyway. 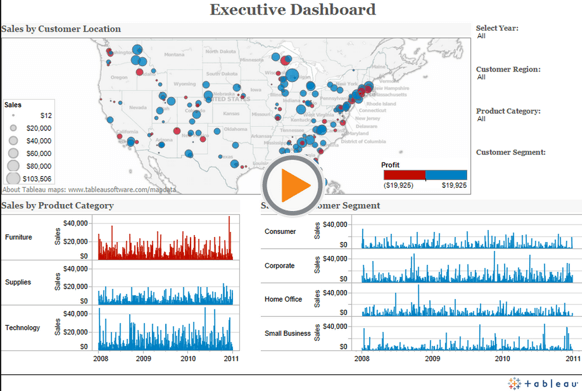 What you build in Tableau looks great instantly (colors, fonts, text size, margins etc.). When you build something in QlikView you need to invest time in formating the visualization, as the visual experience out of the box is questionable. And let's be honest, not every analyst will have the ability to make visual appealing reports from nothing. The following pictures are taken from the first page in a google image search for "QlikView dashboard" (left) and "Tableau dashboard" (right) respectively. I think these give a good example of the difference between the two tools. One of the beautiful things about Tableau is that you can build reports by using your mouse to drag and drop (without ever touching the keypad). This is not the case with QlikView that I see as a more of a tool for an IT department looking to build reports to the business. Tableau on the other hand is also a tool for the business, enabling them to analyse and build report themselves. Tableau is far from being a start-up, but you still get the feeling in glimpse when following the pace of development and innovation. In the last year Tableau has released several cutting edge upgrades to their products. If Tableau keeps the current R&D ratio it bodes well for the future. It is not easy to measure activity in the community surrounding the two programmes, but Tableau seems to be the leader when it comes to activating the community in their forum, creating training videos, highlighting useful blog posts, using twitter etc. One of the most important community features where Tableau differentiates from QlikView is "Tableau Public" that allows everyone to share their visualization with the world. This not only gives a great tool for data journalists and bloggers, but also allows you to go online and seek inspiration on how to build your next visualization. Bonus: Tableau allows you to share reports for free (with hard data limitations though), has instant connection to more than 30 data types, support cubes (if anybody still uses that? ), can be integrated with R, is excellent in mapping..